Moon Hee-jun is one of the latest to join the line of idol stars-turned-musical actors. An official from EDA entertainment, producer of musical “Audition” which Moon is currently starring in, however, hinted that the singer does not like being questioned on the matter. Meeting at Art-one Theater in Daehangro, central Seoul, two hours before his Wednesday show, the former leader of the popular 90’s K-pop group H.O.T. made it obvious that he had no idea about his fellow singers’ acting. The first-ever musical he watched was “Audition,” as the people who wanted him on the show urged the reluctant Moon to see it before deciding on taking the role. “I had no idea what it was about, but ended up laughing, crying and having a questionable feeling left in my heart. It has every factor desirable in a show from laughter to sadness and even a surprising twist, but none of them in an awkward manner. Something about the musical just pulled me in,” said Moon. Premiered in 2007, “Audition” portrays the friendship, love and hope of an unknown rock band. 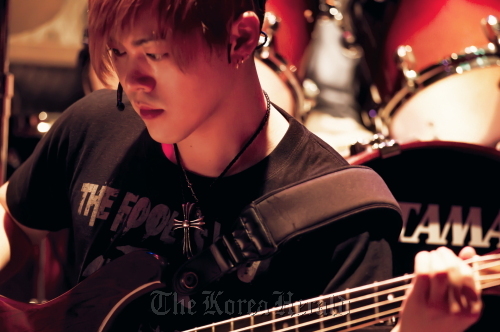 Moon plays Jun-cheol, the band’s leader. The whole show is like a live concert with the band playing all the music. Based on the success of the musical, a decision was made earlier this year to turn it into a movie. Though Moon has spent 16 years in showbiz and went through many hardships ― from the breakup of his legendary boy band to receiving a slew personal attacks online for no apparent reason over several years ― starring in a musical was something he though he could never do. He had to memorize the lines and songs for the two-hour long show when he has a bad memory, so bad that he “cannot even remember the lines to the songs I wrote.” And he had to learn how to play guitar and bass from scratch. Lack of time was the biggest obstacle. Squeezing in practice while handling an already tight schedule packed with TV entertainment programs and overseas concerts was not easy, he said. “I barely slept for more than an hour and a half for three weeks. People might say that I am not doing my best because I do not show up for practices as often as others. But, see this? I think this proves how much I have effort I have been putting into this musical,” said Moon, showing his finger tips, callused from guitar-plucking. “I know I made quite a lot of mistakes on my first two weeks. It was only during my fourth show that I slightly thought it was fun. I am still under endless tension on stage and will be until it is all over,” he said. Despite his worries, however, the musical itself is very entertaining. There are more songs ― actually very good ones ― than lines, which gloss over up Moon’s rather stiff acting. The rest of the band members are such instrumental and vocal experts that their skills masked Moon’s not-yet-perfect bass-playing. For Moon, he could not have met a better character for his debut in the world of musicals. Witty and seasoned, Jun-cheol reminds people of Moon back in his H.O.T. days. The fans seemed blown away near the mini-concert’s finale when Moon performs a solo. Of course, the audience should be given credit for the enthusiastic atmosphere at the theater ― 95 percent were women in their 20s, obviously Moon’s fans, geared up to enthuse over his every move. “I feel grateful to my fans. I know it is not easy to love someone for 16 years. You know, it would be hard to find another former idol star, like me, who still has fans waiting for them outside wherever they go,” he said, proudly. Will musical become another steady genre for the rocker/entertainer/sitcom actor? “It is such an arduous thing. I’m thinking ... not any time soon,” he said. “Audition” runs through July 24 at Art One Theater in Daehangro, central Seoul. Tickets range from 40,000 won to 50,000 won. For more information, call (02) 762-0010 or visit www.e-eda.com.